...Audrey Hepburn thought so, and so does our Sasha! Sash has had a mini-love affair with Paris since she was just 5 years old. She was runner up in a national competition by Mattel and won a huge prize pack including a DVD of the latest Barbie movie, Barbie and the Three Musketeers. She watched that film over and over again and fell in love with everything about Paris and the Eiffel Tower. 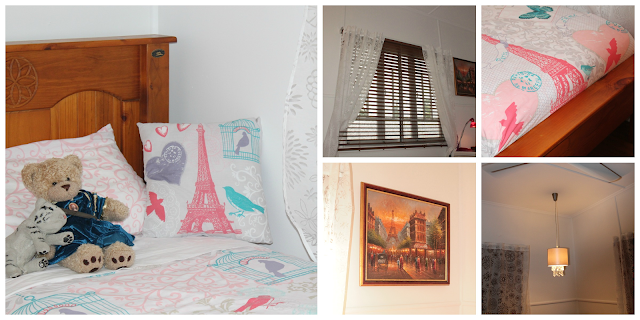 Since then she has collected a few things here and there, so when she was finally able to begin planning her new 'forever' bedroom it was a no-brainer that it would have to be based around a Paris theme. Although she has not been there, (unless of course you include Paris in Las Vegas :) she can at least now enjoy a little bit of Paris in her room at the end of each day! Her room (currently being shared with Poppy) was the first we completed from floor to ceiling. It was so important for the girls to have a safe haven to retreat to at night time, after a full-on day amongst the mess of the reno. ...I know, on face value it looks pretty darn good already right? But once you go past the surface even the cleanest of rooms needs more work than you first imagine. Obviously the first job was to clean it from top to bottom. This room had the filthiest ceilings of the entire house, but with a bit of elbow grease and sugar soap they looked a million dollars, see pic below. 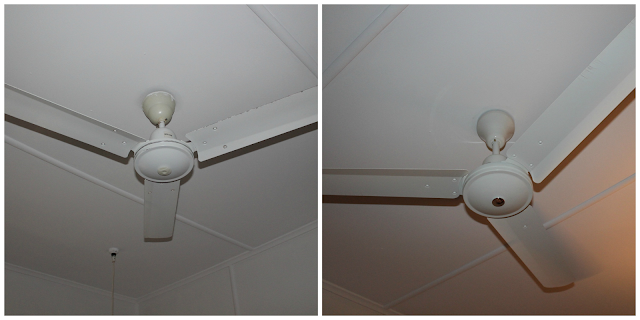 After cleaning, we painted them with Taubman's Ceiling Paint in Crisp White. 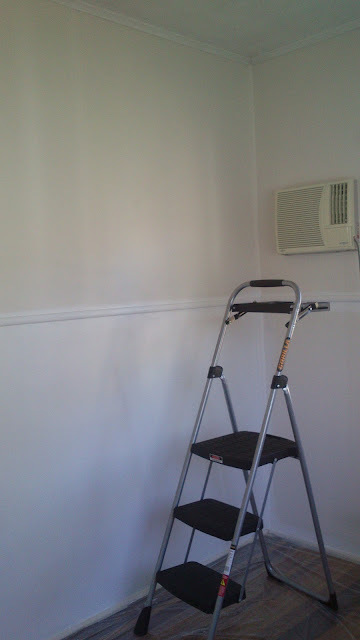 We used Taubmans Endure Low Sheen in Crisp White for the walls. Below you can see what a difference the first coat alone makes to the walls, the lower part has one coat and the top has only been cleaned and cut in. 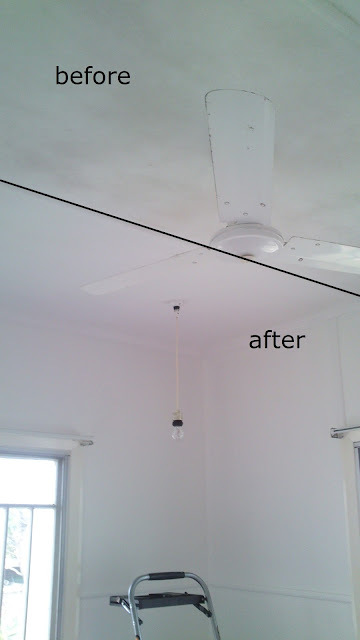 We changed out the ceiling fans, this one wasn't too bad but as we were changing the rest we wanted them to all be the same. We had the electrician remove the 1950's light switches and the (later addition) ceiling fan switches with new all-in-one, neat units. Of course this leaves us with gaping holes in the wall, which Col did a great job of patching. I don't have a finished shot of those yet as our removal came just after it had been filled so we are still in the process of painting the patch but you get the idea from the (nearly finished) last picture below. We used the same Taubmans Crisp White but in a gloss for the doors, door frames and window frames. 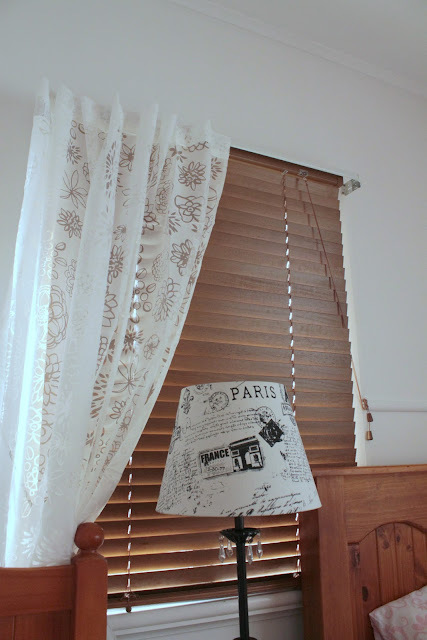 Finally we added gorgeous cedar venetian blinds and sheer patterned curtains over the top. We let Sasha pick out her lamp and pendant light and to finish it all off we added her pictures, new bed sheets and pillows. It looks gorgeous (when it's neat and tidy) and both children love it! We had it 'sleep' ready within the first week and all the electrics completed by the end of the second week. 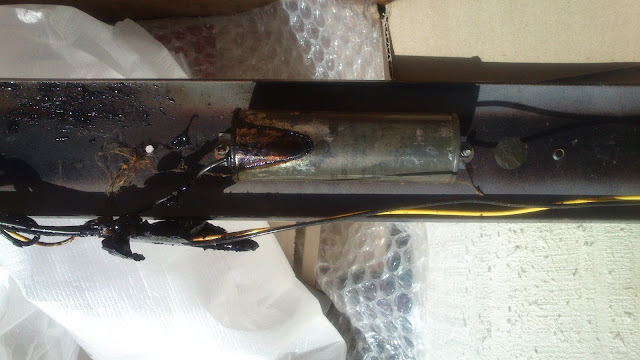 Unfortunately the main art work which was her favourite picture of the Eiffel Tower was one of the only things that arrived smashed to pieces in our removal, so we have a couple of things to add once we have replaced it. But all in all it's a great room. You can check out all the product specs in our Design Book page. PS - This bedroom still has one more transition to come once we move Poppy to her bedroom so watch this space for more updates later on. One of the jobs we absolutely HAD to get done before arriving back in Australia from the USA was to have a new boundary fence put up on the eastern side of the property. 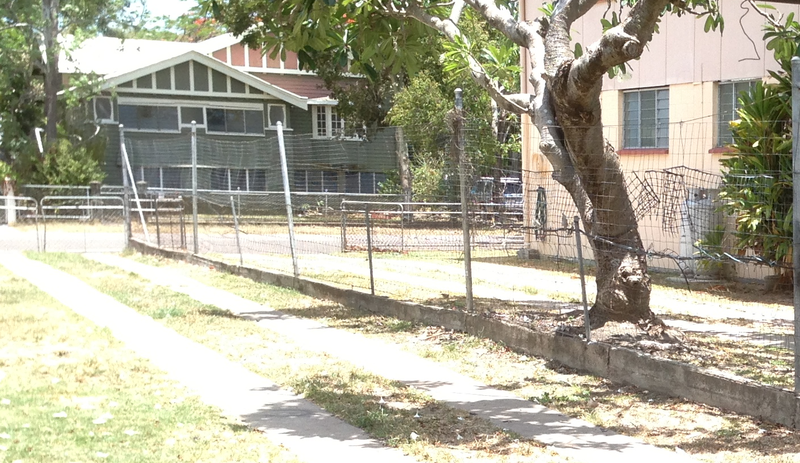 The existing wire fence was unsuitable for our needs, not only was it particularly ugly (see pic below) but it was also way too ‘open’ for our liking. Sometimes you need a little bit more of a’ barrier’ between neighbours (no matter how friendly you are with them) for privacy on both sides and also in our case to keep our dog Red from yapping at the fence at every slight movement next door. To top it all off we didn’t want to pay for it all! Which is where things either go really, really well or you draw a blank…Luckily for us, when we finally managed to get in touch with the owners of the adjoining property, they wholeheartedly agreed that the fence needed to be upgraded and were also happy to foot half the cost of getting it installed. Yayy us!! Yayy them!! After a little liaison via email between us, them and a fencing contractor, we were able to agree on the style of fence, timeline to complete, and a few smaller details on design. Due to some delays with wet weather, the actual construction didn’t start until two days before we flew home, but thankfully it was completed the day before we arrived. And it looks awesome…see?! Not only have we all got a much better outlook, but it also broke the ice between us and our neighbours. It seems to be increasingly harder when you move to a new neighborhood to make friends with your fellow street dwellers. People tend to keep to themselves much more nowadays than in the past. But I plan to change that, just like when I moved to Townsville last time…but that’s another story! PS - We are still playing catch up with these backdated posts, we thought we would be able to knock a few out each night or two…but alas in all reality we are spending so much time working on the actual renovations, that the recording of our progress (on here) tends to fall by the wayside. But we are trying to catch up, please stick with us…. In the infamous words of Forrest Gump (well his Momma if we are going to be exact) you really never know what you are going to get. I had never seen the house in person, as we mentioned here we bought the property sight unseen, so I had never stepped foot inside. Col however had been lucky enough to do an inspection 2 years after we purchased it on a trip up north with work and so had a much better understanding of its layout and size. And there we have it, the buzz word of this post...SIZE!!! Let me explain...Col had shown me pictures, drawn me to-scale layouts, even warned me daily for the last 2 years that we had to begin downsizing..but STILL it was a shock to my 'have-to-see-it-with-my-own-eyes' type system. I looked around and around hoping that more rooms would appear or at the very least more storage opportunities would make themselves known...but nope. All I could think (and say over and over again) was 'where the hell is all our stuff gonna go'. I had no idea at that point that the following 7 days would be SO full on with cleaning, sanding, stripping (a'hem, paint!) cleaning some more, cutting in and rolling walls that I wouldn't have time to worry about the size of the place again for quite some time! ..hello and welcome to our blog. Wow 'our blog' ...that sounds weird!! It has taken us a while to begin this journey online but finally we have taken the plunge! 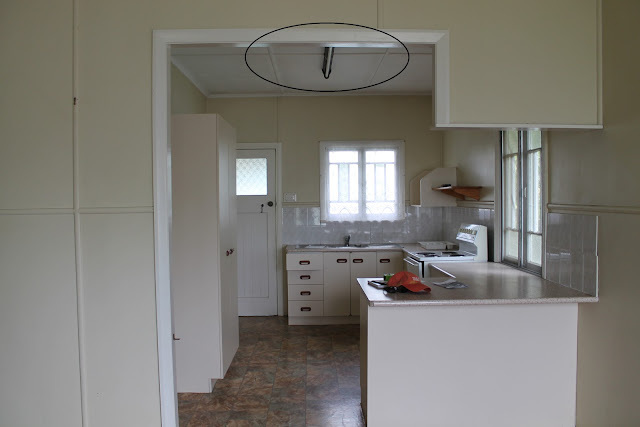 We are a few weeks into our new life in our beloved Far North Queensland, and have begun the renovations that will make up this blog. It has been non-stop in this little household for the last 3 weeks so we shall be updating and backdating our work so far over the coming days. For now...here's the house that welcomed us on our arrival, from here on in it's all... Sunshine and Paint Pots!